If you read my last Tips and Strategies article, then you remember that I focused on the issue of stealth but not from the usual perspective. My emphasis was on becoming a better caster and I argued that the ability to cast further would generally help you catch more fish. Additionally, I also mentioned the idea of line control as being essential to success. For this article, I want to focus a little more on line control. As mentioned in the previous article, stealth has several components. Being sneaky includes things like wearing colors that blend in (I wear camo most of the time), hiding behind rocks, sneaking up on trout from directly downstream, and in general doing your best to not be seen. 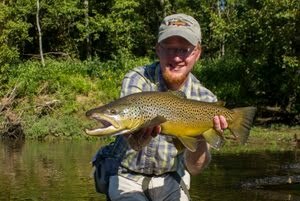 Of course, casting further means that you are able to deliver the flies to the fish before it sees you, but on many of our small streams, there are enough currents that casting further can just as easily become a nightmare. That brings us to line control. Line control is partly a casting issue but also even more important once the line lands on the water. Let's address a couple of different situations. 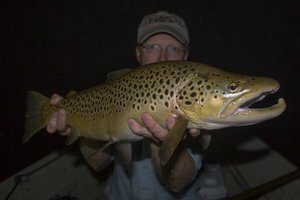 First, scenarios where you have been able to sneak up on the fish and are fishing in close, and then later I'll discuss those times that you are able to cast further to avoid spooking the trout. Sneaking up on fish is always an ideal scenario. If you can get close without spooking the trout, do it before trying to cast further. However, many anglers get close but then fail to seal the deal because of poor line control. For example, let's say you made a 15 foot cast up and across stream. As soon as your dry fly hits, you get about one second of good drift but then are affected by drag and the fly goes skittering downstream or worse yet it gets pulled under as it motorboats its way across the water. Solution? Lift that rod tip. Our standard style of Smokies fishing is called "high sticking" for a good reason. 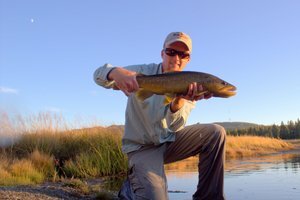 Many people wonder why that fly rod needs to be held so high in the air. It is to keep all the excess line off of the water. I understand that your arm will get tired. Allow that arm to drop just a little and you'll probably quit catching trout. In addition to keeping that rod arm up high, a lot of anglers also forget to strip in excess line as the fly drifts downstream. Remember to do everything in your power to keep as much line off the water as possible. In fact, when I'm fishing in close with the "high stick" style, I'll often have maybe an inch or two of tippet in the water before the fly. That's it. Anymore and the conflicting currents will adversely affect your drift. Finally, when high sticking, keep the rod tip downstream of the fly/indicator. This last one is crucial. In this method, you are almost leading the flies downstream, yet without actually moving them any faster than the water. Your rod tip should track the flies downstream. If you don't keep that rod moving with the water you will end up with drag, even if it is almost unnoticeable. Remember, when you set your hook, always sweep downstream and low to the water with the rod tip. That will keep you from ending up tangled in the overhanging trees. If your rod is already tracking downstream, this setting motion is easy because it is just a sped up extension of what you are already doing. Now, what if you are casting a bit further? Obviously you can't hold 30 feet of fly line up off the water to avoid drag. Line control again becomes a function of both casting as well as what to do once it hits the water. In your cast, consider learning some specialty casts like the reach cast (helps to lay out line up or downstream as necessary to extend your drifts) and the tuck cast (helps your flies hit the water before the line) to buy some drift time. Once the flies are on/in the water, your ability to mend line is what will keep you catching fish. 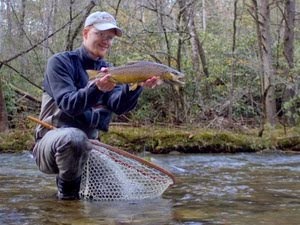 In the Smokies, fish will often hit just as soon as the flies hit the water, but on the larger pools and runs, a long drift can sometimes get you onto fish that you would otherwise miss. Mending line is as much a part of line control as anything. If you are unfamiliar with mending, I highly suggest checking out some of the good online videos on the subject. The concept is pretty basic and once you see it I think it will make a lot of sense. Remember that mending does not always happen upstream. Use mending as a tool to keep your flies drifting naturally and thus you may end up mending up or downstream depending on the current you are trying to deal with. Finally, get creative. For example, when you have the ability to cast a bit further, don't be afraid to lay some of your line on the rocks. That helps keep it off of the water where drag may be introduced to your flies. When you can't see around a rock to watch your fly, look at your leader or fly line for an indication that a fish has taken your fly. 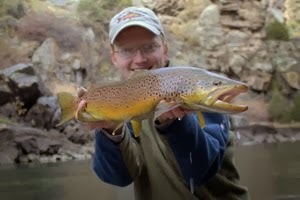 There have been many times I have tossed a dry fly behind a rock and then watched for the telltale twitch in my leader. Sure enough, most of the time there is a nice trout on the other end. Next up on Tips and Strategies, I'll address some fly selection issues. Until then, get out on the water and work on line control.